Description: The best of downtown dartmouth is at your door step! Easily walk to sullivan's pond, the alderney ferry terminal and library, the newly renovated zatzman sportsplex, along with numerous restaurants, cafes, and craft breweries. The unit itself offers 2 bedrooms, 2 full baths, plus a den, in-unit laundry, and plenty of storage. Bright and sunny with high ceilings, and wall-mounted a/c unit to keep you cool in the summer. 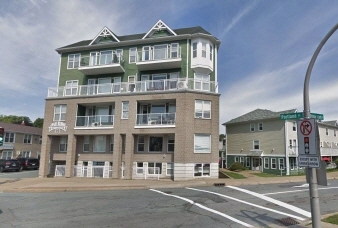 Condo fees include heat and hot water, a fitness room, and one underground parking space. Don't miss your chance on living in the middle of a wonderfully vibrant downtown community! Additional Features and Amenities Other: Appliances Included: Dishwasher, Appliances Included: Stove, Appliances Included: Washer/Dryer Co, Basement: Full, Building Age: 13, Community Features: Golf Course, Community Features: Park, Community Features: Playground, Community Features: Public Tra, Dishwasher, District: 10-Dartmouth Downtown to Burnsid, Driveway/Parking: Other, Driveway/Parking: Parking Spaces(s), Elementary School: Hawthorn Elementary School, Exclusions: Tenant Belongings, Exterior Finish: Brick, Exterior Finish: Cementitious Board, Features: Elevator, Features: Ensuite Bath, Features: Intercom, Flooring: Carpet, Flooring: Ceramic, Flooring: Laminate, Foundation: Concrete, Fridge, Fuel Type: Natural Gas, Garage Details: Underground, Heating/Cooling Type: Baseboard, Heating/Cooling Type: Ductless Cooling, Heating/Cooling Type: Hot Water, High School: Dartmouth High School, Inclusions: Stove, Microwave/Rangehood, Middle/Jr School: Dartmouth South Academy, Parking Details: Parking Space, Prop Size: Under 0.